First off, I should mention that my father's act was largely a function of his personality and the drama he brought to the stage. As a young man he studied ballet and pantomime so that he could learn to properly command the stage and take proper bows, etc. He used big dramatic gestures and little posing effects to enhance things. (Francis Brunn to some degree later emulated this aspect of my father's performance, sort of a dramatic matador effect in his case.) Also, my mother was a very glamorous looking redheaded woman in elegant gowns that added much to the general appearance of his act. Further, my father always worked on a large circular canvas carpet he had spread over the ring or stage just before he entered as a sort of preamble to his entry. All this plus his costumes made him look elegant and special. In talking to my mother, she reminded me and really emphasized how important my father's dramatic manner and personality was in setting him apart from other performers and jugglers. She tells me that in his early days in Russia and Poland, especially, he was an enormous celebrity with people forming autograph-seeking lines and women asking to dance with him. In Poland he was seen off by the ambassador. Stalin personally made it possible for my mother to leave Russia with him. He sometimes got ten return calls for bows from the roaring audiences. As I recall, on the second or third year of his Ringling show appearances, he came out dressed like D'Artagnan, a musketeer, with a big plumed hat and a sword on which do some ball balancing. 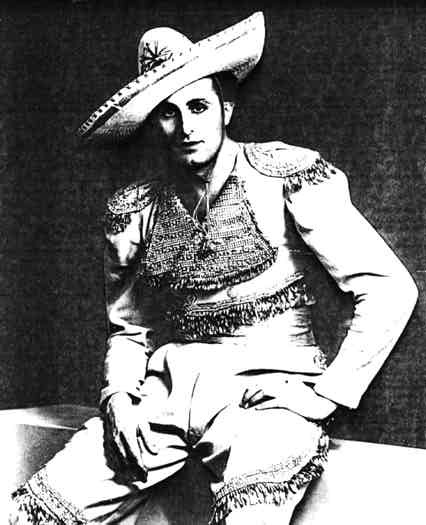 In Europe, he often had a large Mexican style hat and a sort of white goucho-like outfit. The point is that he did not look like an acrobat, as did Rastelli, and disliked that sort of image for himself. There was a dignity to his presence that is usually absent with jugglers. He wanted to look distinctive and dominating, and he greatly succeeded. He had a kind of "mad Russian" intensity about his whole demeanor and conveyed a general seriousness about what he was doing. That is partly why the popcorn gag and the stuff with Emmett Kelly went over so well, by contrast. Finally, in my preamble here, I should mention that he was always very concerned about appropriate music, some of which he even wrote (I remember his getting a musician with the Merle Evans band on Ringling to transcribe some of his melodies and suggested arrangements for that use). He used music like "Holiday for Strings" near the beginning and the "Saber Dance" for his torch juggling finale. He saw what he did as a total performance and not just doing some tricks. He always opened with a three sticks routine. Emphasis was on speed and the look of speed. It included the usual under the legs and behind the back continuous tosses, a shower which looked effective because it was done "sideways" (that is, with the spinning done on the plane parallel to his face), cascading the sticks upright without spinning, spinning the sticks on the top of his head as they went from one hand to the other, and a fast finish in which he actually held on to the sticks and swung them over his shoulders and back (really a kind of waving of the sticks which made them look like they were going twice as fast as they really were being tossed). All this was done with some little posed moves from time to time as he might break it up with things like placing the stick on the forehead for a short balance, etc. He then tossed one club away and did the four clubs two on each side, leaping from side to side in very impressive fashion. This was done to a drum beat as he got wider and wider apart with the clubs. He then juggled four knives with a small white solid rubber ball (about 3 or 4 inches in diameter), as a 5 object cascade. He then tossed the ball to his forehead, bounced it initially until it settle down. He held the 4 knives out (2 in each hand) as he manipulated the ball from ear to ear and also sometimes around his back and from one ear to his forehead and then to the other ear and back to center. He would also sometimes roll the little ball from his forehead to the end of his nose where he would briefly balance it. A large ball would then be tossed to him and he would balance the big ball on the little white one and vice-versa (holding the lower one in his hand). 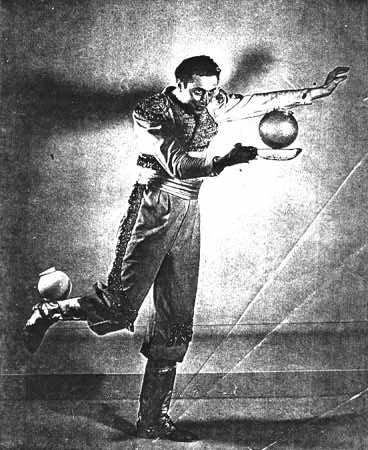 He then balanced the little ball on his forehead, the big ball on his foot (in front) while juggling the four knives to end this segment. 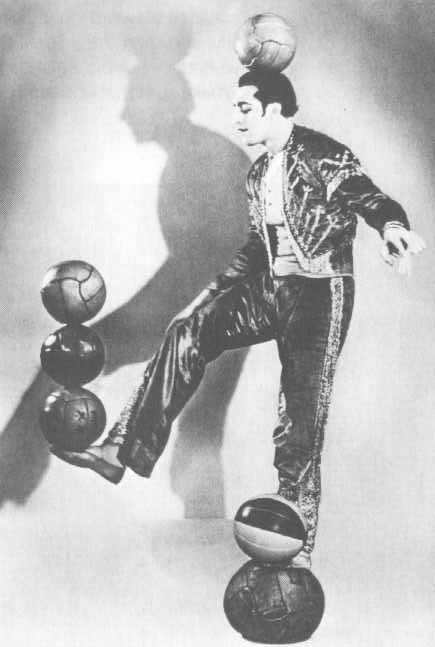 As I recall, and here I am a bit dim, he then did some larger ball manipulations, usually including briefly juggling the four big balls. I think it was here that in earlier years he did the glass globes manipulations. This involved using his mouthpiece with two balls, doing switches from foot to head and foot to back of the neck. I think it was here that he did the three (sometimes four) stacked large balls on the foot ending. (I might mention that my father's balls were usually covered with spangles which we would tape onto the balls, so they looked like silver spheres.) He avoided the look of standard athletic props. 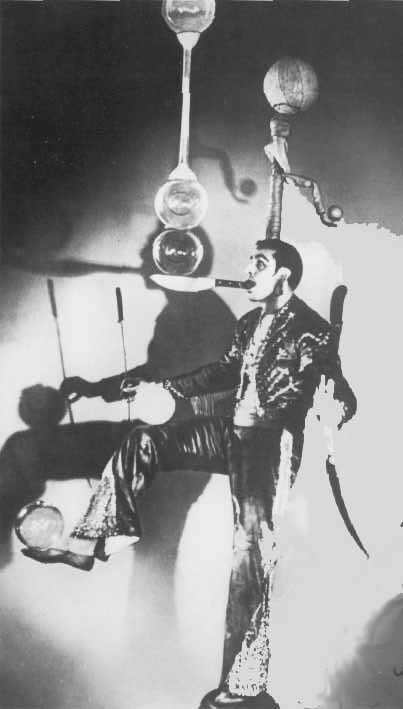 I always liked my father's use of the glass fishbowls, but they were frequently breaking (not always while he was juggling), and I think he stopped using them partly because he felt that American audiences really did not appreciate the difficulty compared with balls (especially some tough effects like when he switched two, one on the back of his neck and the other on his foot in front, where the big problem was avoiding them hitting one another). We were always shopping for appropriate replacements in strange cities, I remember. They were really more like the globes you get in lighting shops (round and not flat on the bottom) and at the end that may be what he used, but the current lighting globes I see around now seem to me to be a bit thinner so more fragile than the bowls he used. Next, he was tossed a rod (about 3 feet long). He would hold out the rod like a sword and first balance the ball on its edge. The rod had a nail sticking up on its narrower end. He spun the ball (about soccer size) on the rod (much like you would on the end of your finger) and balanced the rod on his forehead with the ball spinning on the end while my mother would hand him five plates. 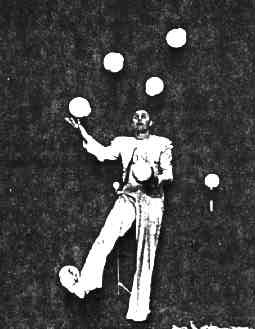 He would then juggle the 5 plates while continuing to balance the rod and spinning ball. 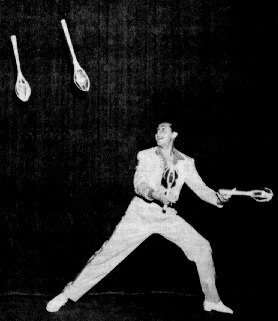 He would stop juggling and then, using the plates in his hand, knock the rod out from between him and the ball and bounce the ball to a stop on his forehead. He would then exchange this bigger ball for a smaller one (about 8 inches in diameter). He would then start bouncing that smaller ball on his head. 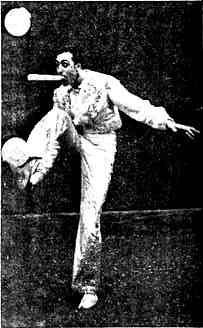 He would place a sixth plate between his teeth and then start juggling the five plates while bouncing the ball on his forehead and then, take the sixth plate from his mouth, added this to make it juggling six plate while continuing the bouncing. (I think my father considered this perhaps his most difficult trick because of the two different tempos involved.) Often in doing this effect, he would intentionally drop them (covering his head with his arms as they fell around him) to impress the difficulty upon the audience. It was at that point that Emmett Kelly, who had been watching on the sidelines, would approach my father with a large bag for a big laugh. He then got the mouth piece (knife shaped but with a flat top). He did some manipulations with the ball and mouthpiece and then threw the ball into the audience for the audience members to return the ball so he could catch it on the mouthpiece. 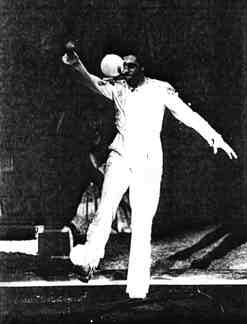 I was always greatly impressed by how he could toss that damned ball so far into the audience. Usually at the end of this segment, he would catch a rolling ball (badly tossed to him) by sitting down and then lying down (for this he would get me or some stooge in the audience to toss the ball to him so it would roll on the floor to him.) This would all end with the popcorn gag when a stooge in the audience (often a woman) would try to toss the ball back and hit the popcorn concessionaire's box (scattering popcorn everywhere). The vendor would act very upset about losing his popcorn while yelling that my father would have to pay for the popcorn scattered. My father would shrug and then the lights would dim and the exciting music ("The Saber Dance") would surge forward as he was handed torches. My father's three torch routine was outstanding. Sometimes he would start by juggling five torches. He did this near the end of his life and said he used to do it in Europe. But usually he just did the 3 torches along for the finale. Much like the opening three sticks routine, it was very fast. It ended with my father tossing the torches up from behind his back with high triple spins. This ended with a toss behind the back of one torch way up to high to the very top of the tent. I was always amazed at how he managed to get the thing to go so high up. The crowd would usually register a big "ooooh" as the thing went up to the ceiling. He would end the torch routine finally with the rapid waving effect I mentioned he did with the three sticks as my mother would pull him from the back (guiding him) as he walked backwards off stage, seeming to be more-or-less dragged off by my mother. (In some venues, fire laws made it impossible to do the torches, so my father had some clubs made up with flashlight bulbs at each end with batteries attached, so he could simulate the effect in the darkness -- though without such dramatic results). The lights would then come on and he would usually return to bow and enjoy the thunderous applause.